When the Centers for Disease Control and Prevention (CDC) announced that cases of tick, mosquito and fleas had increased dramatically in the past 14 years, it spread faster than the flu on social media. “Farewell, carefree days of summer,” the New York Times wrote. As a parent myself, I know I have to think more about protecting my kids from bug bites than my parents did for me. First of all, our environment is more hospitable to these bugs. Our deer population has exploded in recent years, which gives deer ticks a place to live and breed. Funding for mosquito control measures has decreased, so it’s harder to control the mosquito population. While the CDC report didn’t address the issue of climate change, areas that were previously cooler have warmed, allowing the tick and mosquito populations to thrive. Not only can tick and mosquito bites make a child uncomfortable, diseases like Lyme, B. miyamotoi and others can present additional health risks. The headlines are alarming. But your family doesn’t have to stay indoors this summer to stay healthy. Apply bug repellent, especially at dawn and dusk: As your family transitions to your summer schedule, make applying bug repellent part of your morning routine. This is especially important if a member of the family is doing activities like a nature walk, forest hike, or will be picnicking in grass. Reapply the repellent for those evening athletic games and practices to keep mosquitoes at bay. Know your ticks: There are two common kinds of ticks in our region: Deer ticks and dog ticks. Most tick-borne illnesses in New England are transmitted by the smaller deer ticks. 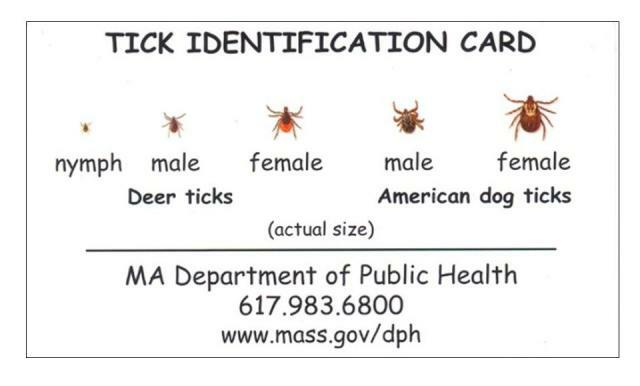 Check out this printable reference guide from the Massachusetts Department of Public Health on how to identify a tick. Remove ticks when they bite: Whether it’s a deer tick or dog tick, remove an embedded tick as soon as you find it. Using tweezers, grasp as much of the tick as you can as close to the skin as possible, pulling firmly and steadily to remove. If you don’t remove the entire tick, don’t worry. The parts that remain attached get reabsorbed and won’t cause harm. Monitor the area: Once the tick is removed, observe area periodically for the next several weeks. More than half of patients with Lyme disease see an expanding rash after a bite. If you notice a rash that’s growing, call your doctor. Keep an eye out for summer fevers: In the winter months, an illness accompanied by fever often means a patient has the flu. But summer viruses transmitted by bugs can also cause a fever, so it’s possible your family member has a bug-borne illness. It’s best to call your doctor, especially if you’ve had mosquito or tick bites. Don’t let fear of bug-borne illness keep your family from enjoying the summer months. By taking some precautions, you can safely enjoy all summer in New England has to offer. Todd Ellerin, MD is Director of Infectious Disease at South Shore Health.